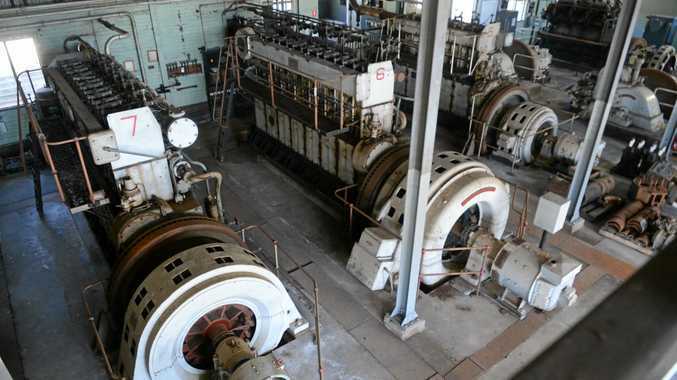 A CENTURY old hydro electric power station near Mullumbimby might soon be flowing again, delivering local and renewable energy to the town. The Mullumbimby hydro power station was first switched on back in 1925, just in time to power the town's Christmas lights that year. For 40 years it delivered local power to Byron Shire before being shut down in the mid-1960s after the national electricity grid came online, with its big coal-fired power stations. Now the State Government has provided $22,000 for a pre-feasibility study to assess options for recommissioning the plant. It's part of a wider project by Community Owned Renewable Energy Mullumbimby (COREM) to power Mullumbimby with 100% renewable energy by 2020. COREM project manager Svea Pitman said the 300kw plant could potentially supply 70% of Mullumbimby's night time power useage - effectively working as a giant battery when the sun wasn't shining. The power station is fed water via a concrete channel which runs down from the Laverty's Gap weir on nearby Wilsons Creek. The same infrastructure also delivers town water to Mullumbimby. "At the moment what we need to do is get a couple of new turbines, as most of the pipe and infrastructure from the weir is still in place," Ms Pitman said. Essential Energy have kept the power station in good condition, recently spending $2 million re-roofing the facility to remove asbestos. Mullumbimby's Hydro-electric Power Station: Nationals Parliamentary Secretary for Renewable Energy and Northern NSW Ben Franklin with COREM's project manager Svea Pitman at the Mullumbimby's Hydro-electric Power Station which operated from 1926 until the 1960s. It was scheduled for demolition in 2008 but the community acted quickly to get the facility listed on the heritage register. Ms Pitman said it was internationally significant. "We're lucky to have a really big history of renewable energy in Mullumbimby." Inside the old building is a treasure trove of vintage engineering delights, including a pair of Boving & Co. Pelton water turbines - two of only a handful in the world left in their original place. Nationals Parliamentary Secretary for Renewable Energy and Northern NSW Ben Franklin said if the pre-feasibility study stacked up, he would be lobbying for more funding to get the project off the ground. "If we can get this up and running this would be a first in Australia, and it's something that I think the community would be very proud of." "The community wants a clean and green energy future, and this project delivers just that." The report is expected to be completed by the end of next month.